If you’re looking for a bike that you can cruise your neighborhood on, take on short errands, or an easy and fun way to be outdoors, then a comfort bike might be for you. Comfort bikes are created solely for comfort and ease while riding on flat, paved or dirt roads to minimize the bumps by the bike rider. A comfort bike’s notable features are high handlebars, suspension in the seat and in the fork, and a wide, comfortable seat. Comfort bikes are not as complicated as your typical 10-speed, as the gears are lower, but the lower gears assist in climbing uphill. Overall, comfort bikes are less expensive than other types of bikes. Although comfort bikes are made primarily for women, comfort bikes come in models for men as well. we've focused on quality cheap comfort bikes in the under $500 - $1000 range, but prices change all the time - the price you see listed on the product page is always the correct current price! Hybrid bikes are another kind of bike that you can use for leisurely riding. If you’re unsure of which bike to choose, you should look at the difference between the two kinds and make an informed decision. First, there are a few questions that you can ask yourself when it comes to the kind of bike you’d like to have. What matters more to you: quality or cost? Are you into the latest gadgets or do you have more simple tastes? What kind of riding would you like to do? The final question here should help you decide between a comfort bike or a hybrid bike. Comfort bike riding is more relaxed, like a trip to the park with your family. It’s a leisurely ride that isn’t focused on power, but focused the quality of your ride. A comfort bike will have you in the upright position, which is easier on your back, and makes a quick trip to the store not only easy, but less expensive than driving your car. A hybrid bike can offer a little more power and efficiency for your pedaling efforts. If you want to go a little further, for some heart-pumping exercise that is easier on your knees, a hybrid bike may be the bike for you. You still get the comfort of a comfort bike, but more options in the types of rides you want to have. Structurally, the comfort bike and the hybrid bike are built a little differently to give you the different kinds of riding experiences. The type of wheels is the biggest difference. Comfort bikes use 26-inch mountain bike tires, which are wider and have more air to cushion your ride from any bumps and ruts in the road. If you want even more traction and comfort, you can put knobby tires on your comfort bike, which are especially helpful for riding on dirt roads. Hybrid bikes are outfitted with 26-inch road bike tires (700c). These tires are best for easily riding on pavement and make climbing easier. If you want to diversify the road surfaces you ride on, this wheel can take tires that range from 23mm to 44mm. Whichever comfortable ride you choose, your bike’s frame is an important part of your riding experience. There are a few materials that you can choose from: aluminum, chromoly steel, high-tensile steel, and other materials which are carbon-based. Aluminum offers an affordable ride. It’s light yet strong and can resist rust or corrosion, but it’s more expensive that high-tensile steel. Chromoly Steel is an economical steel alloy which is lightweight and gives a nice ride, but it can rust if it’s neglect. It’s also more expensive that high-tensile steel. High-Tensile Steel is the most affordable material which provides a nice ride. You’ll find this material in entry-level bikes. The downside is that it can rust if you don’t care of it and it is heavier than other materials. Carbon-based (carbon-fiber or carbon/aluminum composites) is high-end and has all the things you’d want: it’s the strongest, lightest, and also resists rusts and corrosion. You’ll get a great ride, but it does come at a price, as it is the most expensive material. In both hybrid and comfort bikes, the suspension fork is a feature that you’ll usually find. Suspension forks utilize use elastomers or coil springs which act as shock absorbers whenever you ride over unevenness or obstacles you’d find on the road. What results is a smoother, more comfortable ride. In order to find the best suspension fork system for you, you should make sure that you take the bike for a test ride. Another type of suspension used in both comfort and hybrid bikes are found in the seatposts. If you are bothered by a bike’s vibration or other kinds of bumps and impacts from the road, the suspension seatpost can help your lower back and your whole body feel better and more at ease. Even if your bike doesn’t come with a suspension seatpost, you can buy one separately and have it installed. There are plenty of other features that you can find in a comfort or hybrid bike. The saddle or seat is where you can find the most innovation in comfort for a bike. Comfort bikes can provide saddles that come with springs, along with gel and foam padding. Hybrid bikes can offer comfortable saddles which are both sleek and soft and help you to paddle more efficiently. If you have special seating needs (e.g., lower back pain), you have find saddles with flexible frames, with anatomical shapes, and with cutouts that can prevent pain and numbness while riding. You can even find a saddle that has all of these features. The best way to find the right saddle for you is to ride the bike and see if it meets your comfort level. Again, the best way to find the best brakes for you is to ride the bike and test if you like how the brakes feel and handle as you ride. You may not think that the gears of your bike will be important for a comfort bike or a hybrid, but the technology has advanced wear gear-shifting is effortless and aids in making your bike ride a pleasant one. Unlike previous biking technology, you can’t even feel the gears shifting. They just click into place and you can see the current gear displayed. If you’re just riding on flat terrain, you could use a single-speed, a 7-speed, or 8-speed. If you have a trailer or want to climb hills, a 24 speed or a 27 speed. Finding the right sized bike is important. It’s best to go your local bike shop and try the bike, even if you end up buying it online later. A bike shop can make sure you have the right sized tires, seat, and frame, and will adjust everything so that you can rid with comfort and ease. You’ll also get some advice on how to ride, brake, and shift gears. The standover height of your bike frame: You should know your inseam and have at least an inch clearance for a road bike type frame or two inches for a mountain bike type frame. If it’s a hybrid frame that’s more of a commuting bike, then the road bike guidelines apply. Otherwise, if it’s a step-through or a beach cruiser type of bike, this isn’t as much of an issue. Upper body position: For a road bike frame, you’ll want to form a 45 degree angle. But mountain bike frames and hybrids, you will have a more relaxed position, with your torso up higher. Saddle height: Especially for a road bike type of frame, you’d want nearly full extension of your leg (80 to 90 percent) when seated. Saddle position: This is called the fore-and-aft saddle position, or how far or close your bike seat is from your handle bar. You’ll need help with this to check your right foot in the pedal. Your knee should be in line with pedal axle. You can have a plumb line dropped from your knee and is should hit the ball of your foot. Your bike seat should be parallel with the ground, so adjust accordingly. 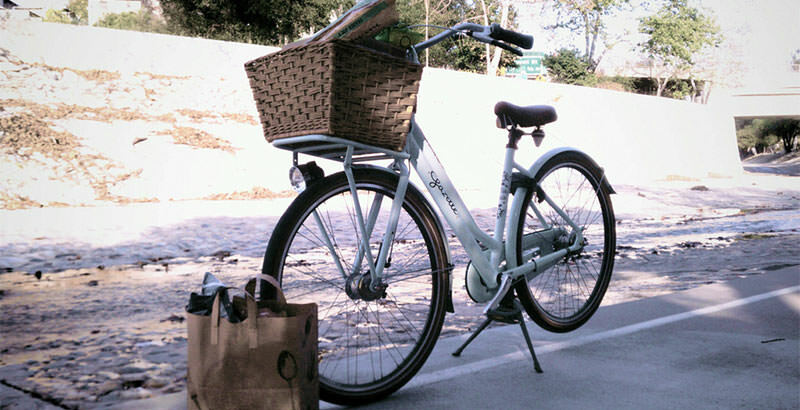 Whether you buy your comfort bike or your hybrid in a store or online, you’ll want to make sure that you get any necessary bike accessories, such as a bike basket, a bell, helmets, bike lights, repair kits for your tires, tire pumps, or any other accessories you’d need—especially for longer rides. It’s also important to get a good bike lock, especially if you live in the city or have to park your bike outdoors. You can find the right comfort bike for your needs and within your budget. If you need any assistance, you can go to a bike shop or refer to biking books or magazines, or consult with a local bike group in your community or town. Soon, you’ll be enjoying your neighborhood and in brand new ways.